Today was the longest mid-week long run I have ever done. It was a 12 mile one. Although I had set my alarm for 5:30 AM I goofed and it was set for 5:30 PM so I awoke with a start at 7 AM. Yuck, this meant I was going to be late for work. When I woke it was 74 degrees F (what?! ), hot and humid. The streets were wet with rain. I headed down Metric to Research, and then another mile on Research. I carried water and a Clif Shot. On the out segment I was running into the wind. I also seemed to be always running uphill. Ugh. Midway I had finished all my water and downed the mocha Clif Shot at 6 miles. Part way home I stopped at a gas station to refill my water. I finished the run, but it was a struggle. I was soaked with sweat. This is not getting easier, and I’m supposed to get stronger, but I just feel weaker. I was probably doing 10 minutes/mile. Bottom line, it was a crappy mid-week long run. I keep reading about my coach and how he’s just running smoothly and consistently. What is wrong with me? Why is it so hard? 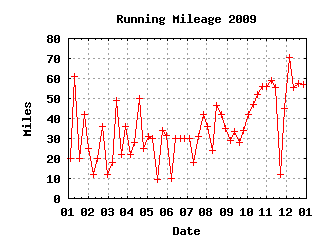 So here is my weekly mileage this year up to now. You can tell when the class started in September, and you can also see the mileage climbing over the past few weeks as I’m following the “advance” schedule. I hope I can keep up without injury. This week was the 16 mile Eastside long run. I ran all by myself while listening to my iPod for this week’s long run. I tried to run easy, but I was having more difficulty this week. I mean last week’s run was awesome, but this week’s run was ahhh so so. At 50 minutes I had a chocolate Clif Shot, and at 1:40 I has a mocha Clif Shot so I was fueled. Even though I enjoyed the final downhill miles on Speedway and Congress, it just wasn’t satisfying. Oh well. They all can’t be like last week. I completed it on 2:27:47 or 9:14 minutes/mile and that included all the water stops. The time was reasonable, but again just not satisfying. I’ve been running the advanced mileage for the last two weeks. Today it was raining when I woke up. I thought about skipping my run, but the schedule said I need to do 10 miles with strides. By the way this week after class I had a discussion with my coach who asked if I was doing my strides and I said yes. However today I tried, but I was water logged and tired. Although the first few miles went by OK, it was the last few miles that I considered a “death march”. I just tried to get it over with. So I attempted to do my strides, but I don’t think I did them very well in the rain. I could feel that my hat, top, shorts, and shoes weighed tons with all the rain water in them. Another 10 mile steady run tonight. The two mile warm-up was 19:00. The first timed 1/2 mile was 4:28 (should have been 4:35, so that was close), and the second timed 1/2 mile was 4:58 (way too slow because we had to wait for the traffic light). The first two mile loop was 17:15 (too fast), and the second two mile loop was 17:27 (still too fast). The return first timed 1/2 mile was 4:26 (again close to my expected, but a bit fast), and the return second timed 1/2 mile was 4:24 (I just seem to like this pace). The two mile cool-down was 18:11 (cool-down is supposed to be slower than the warm-up, oops). The overall 10 miles was 1:30 or 9:00 minutes/mile pace. On Wednesday I had to get up early and didn’t run. I attended a one-day local tech conference and most of the day I was sitting. So that night I debated with myself if I should do my run since it was late. In the end I choose to do it. Although it was after dinner (full tummy – ugh) I completed 5 miles through my neighborhood. My run was real easy and I’m glad I got it done. The next day I got back into my normal routine of running in the morning. I ran nine miles which for me is a very long morning run. Near the end I was feeling weak and wobbly. With a mile to go I realized that I hadn’t had breakfast or anything else to eat for the past 12 hours. No wonder I was totally depleted and feeling like a slug. I had just run 14 miles on empty! On Friday I took the day off as was scheduled. For this I was glad. Saturday was a 14 mile long run called the Roguette. I ate breakfast beforehand and has one Mocha Clif Shot half way. I ran it easy, but consistent. I don’t exactly know if I kept it conversational since I listened to my iPod mostly, but I think I did. It felt that way. I was relaxed. The weather was great. It was sunny and about 60 degrees Fahrenheit. For some unknown reason I was just cruisin’. I completed it in 2:03 or 8:47 pace. Wow! What a marvelous run. Let’s have more of those. P.S. Afterwards Katie told me I had passed her on San Jacinto, but I never saw her. She was walking, having a tough day, and I was probably in the “zone”. Sigh, I should have seen her. At class tonight I was to run 10 miles (the advanced distance) with 6 of those miles at Marathon Goal Pace or MGP. Since I’m shooting for a 4 hour marathon, I needed to run a 9:10 minutes per mile pace for my MGP. There was a two mile warm up and then we’d reach a cone where the MGP would start. There would be cones at mile 0, mile 0.5 and then a two mile loop. It was an out and back course with two 2-mile loops. Naturally I took off ahead of everyone and got lost during the warm up, however, I got back on course only losing about 3 minutes along the way. The first timed half mile was 4:24 (should have been 4:35). I was going too fast (the story of my life) so I tried to slow down. The second half mile was 4:23 (also should have been 4:35, sheesh, slow down will ya). The first two mile loop was 17:26 (should have been 18:20). The second two mile loop was 17:38. The first returning half mile was 4:39 (now that’s better). The second returning half mile was 4:33 (A-OK). And over all it took me 1:35:18 for the entire 10 mile journey including the lost portion. I rarely run that long in an evening. When it was all over I was tired, and sweaty (it was 70+ degrees out) but not exhausted. Coach and I talked and then I headed home for a light dinner.